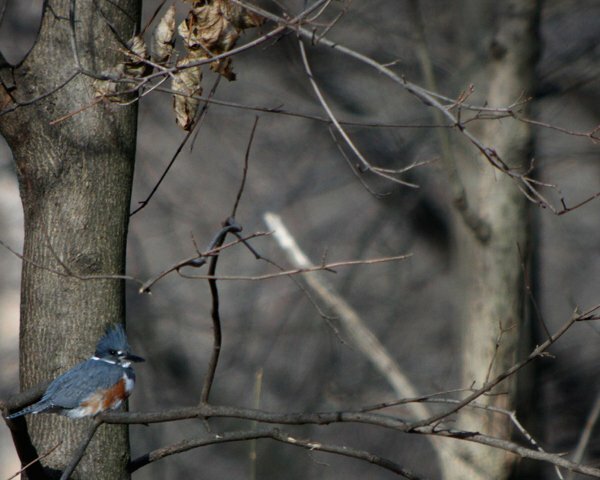 Decent Pictures of a Belted Kingfisher? Unpossible! Almost every birder who has birded within in the range of Megaceryle alcyon, better known as the Belted Kingfisher, knows the drill. The first moment you are aware of a nearby kingfisher is when you hear its rattling call as it takes off away from you. If you try to get closer looks it just flies again. Eventually, if you persist, it will find a way to get around you and back to its original perch and you find yourself on the banks of a creek or the edge of a lake, having wandered hundreds of meters out of your way, and, if you’re lucky, you might have some long range, lousy pictures to show for it. 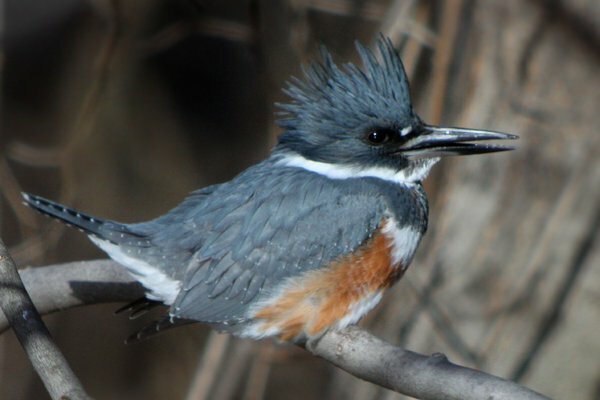 You can imagine my utter amazement at my most recent encounter with a Belted Kingfisher. Not only did I notice her* perched near me before she called, but she noticed me noticing her and DID NOT FLUSH as I worked my way around to get the sun behind me, set my tripod down, got my camera attached to my scope, and started taking pictures. Not only that, but when she switched perches, which I am convinced had nothing to do with my presence, she let me switch my perch – so to speak – as well and digiscope some more! Why? 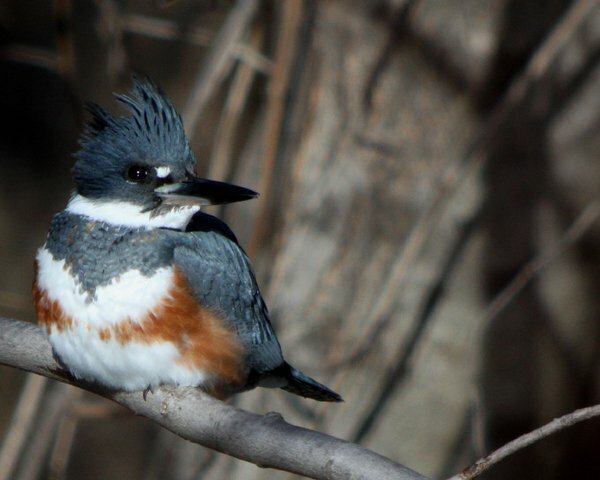 Why would a Belted Kingfisher behave in a way that is so out of character? For one, she was at Van Saun Park, which is not that big a place, and is a park that is pretty well visited by people who aren’t paying much attention to birds, so she may have become acclimated to people passing without molesting her. Also, after a cold night the night before, there was not a lot of open water suitable for a kingfisher to fish in, so she may been loathe to leave her prime foraging habitat. She did seem healthy and I later watched her take a fish further downstream, so it seems that she was getting enough to eat. Whatever the reason was, I certainly enjoyed the chance to get some decent shots of a Belted Kingfisher, finally! 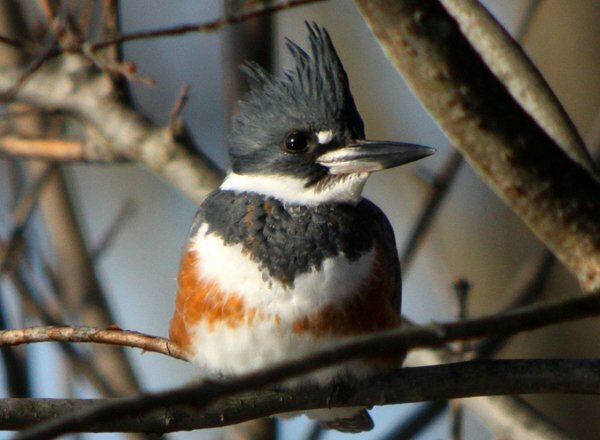 *You can tell a Belted Kingfisher is a female by the orange-ish band across the chest. Males have only the blue. Awesome! You nailed the common dilemma and fate was on your side that day! Really nice shots. What size lens were you shooting and how close were you? Nice shots! Glad to see that you finally ran into a friendly, obliging Belted Kingfisher. Lovely, didnt know the existence of a belted KF. only recently did I see a black-capped one. Sweet photos Corey! I know “the drill” all too well. One of my nemesis photo birds for sure. They need to learn trust. Beautiful shots! I’ll call all your pics and posts lousy so long as you lead in our little competition here. Hope you don’t mind. Thanks for the great pics and the info on the rust colored breast for the female. Guess I have mostly seen males, and NEVER with a camera in hand. Marvelous! @Rico: I shoot with a Canon EOS 50D attached to a Swarovski spotting scope. a good look at kingfisher? Near NYC one surviving bird here heard occasionally is the kingfisher and he flies over the unfrozen water and along the stream. A charmer for sure and welcomed mightily. Just a week or so ago I saw a small hawk which is so common, but then I heard the kingfisher and became alarmed. This was in an open area and flying low over the stream he landed across the narrow stream bed on a solitary tree, quite visisible. Since I ALWAYS loved the kingfishers I actually backtracked to the other side as I feared for the life of this tiny bird. I could not find the hawk but I know it landed near, I reluctantly left but used my cell phone to take a pic, I hope the fisher made it. GREAT shots! I, too, have been trying for quite awhile to get some decent shots of a Belted Kingfisher. You perfectly described my “adventures” on many, many quests! Your success is fantastic and you got some beautiful pictures – kudos!